There’s a big snowstorm hitting the northeast and my home is supposed to see at least a foot, so I’ve got another snow-inspired mani to celebrate. Today’s look is brought to you by the letter S, for snow…no wait, it is brought to you by Julep “Dendrie” and Sephora Formula X “Wham!”. I was inspired by Chalkboard Nails’ gorgeous glitter gradient using the cobalt sibling of “Wham!”, “TNT”, but couldn’t quite choose if I wanted to do the gradient from the base or the tips of my nails. So, in the spirit of indecision, I went with both, and threw in a few where I just did “Wham!” as a topper, sans gradient. I really like “Dendrie” as an under-color: it is very opaque and pretty cooperative. I had seen some poor reviews of “Wham!” on Sephora’s website, but I really like how it looks, and wasn’t surprised with how it wore. Some of the bigger bar glitter can stick up, but I compensated by smothering everything in my favorite HK Girl topcoat. I had reservations about the glitter gradient from the base of my nails, since they are so short (can one “elongate” nails? ), but I think it went surprisingly well, so expect future gradients (especially since gradients are the most advanced nail art I can handle at this point). 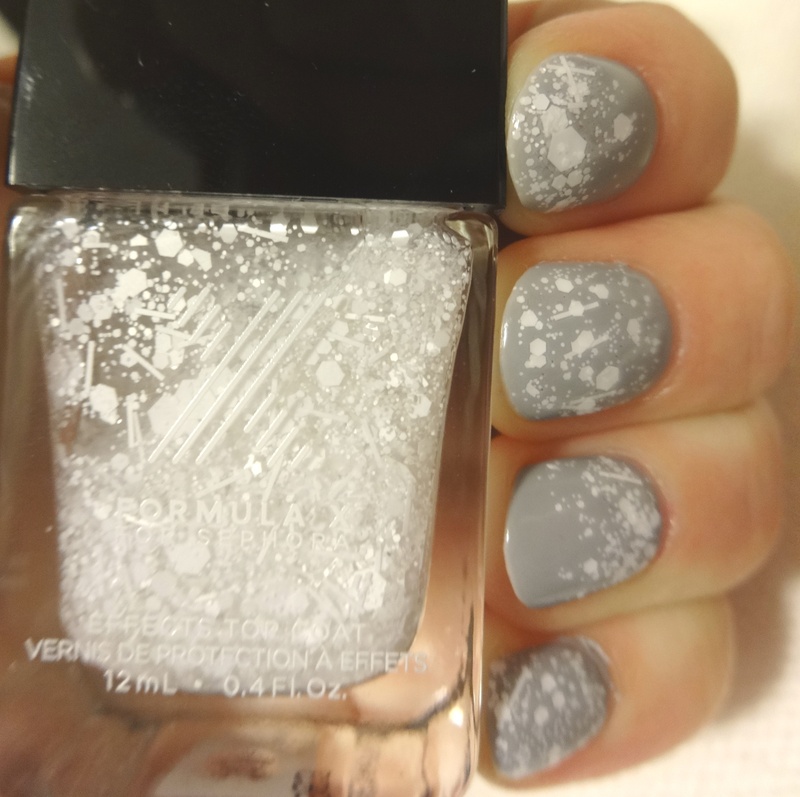 If anyone is feeling the snow look, I’ve seen a lot of similar white multi-size glitters out there recently, including a few drugstore versions (so don’t feel like you have to shell out for the Sephora version).